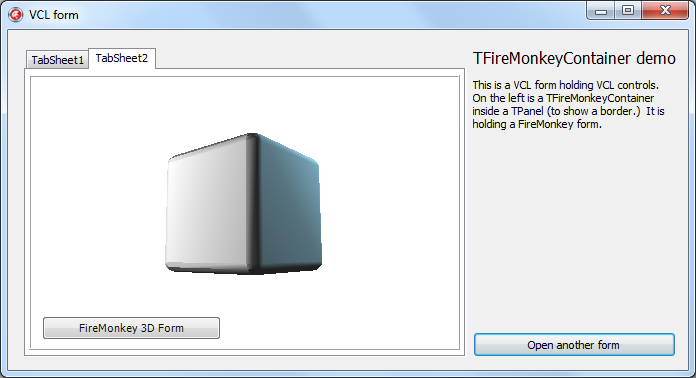 TFireMonkeyContainer is a small open-source VCL component that can host a FMX form, allowing you to embed FireMonkey forms inside your VCL application. If running in debug, you would get an assert in this situation. If running in release, you would notice focus issues, where the host form may not have drawn its title bar as though it was the active form when the FMX form inside it was focused. If you only ever had one embedded FMX form per VCL form or if you never created an instance at runtime, ie only used it by placing a TFireMonkeyContainer on a form at designtime, you wouldn’t run into this bug, although this update does clean up the code and you should use this latest version anyway. If you haven’t used TFireMonkeyContainer before, and you want to make use of FMX in your VCL app, try it out! You can find the project on Google Code, and check out or update the source from SVN. Read more posts about it on the Code & Components page.